Boo! Halloween is on the way. Griffintown has had its very own florist for almost 50 years, but did you know that Griffintown has had its very own ghost for even longer? Once, Montreal was the economic center of Canada, and all that bustling activity surrounded the Lachine canal. Griffintown was an industrial neighborhood filled with low-income immigrants who worked on the canal. Many women were reduced to prostitution to make ends meet. Friends Mary Gallagher and Susan Kennedy were both prostitutes. On June 27, 1879 Mary Gallagher's decapitated body was discovered on the second floor of a building at 242 rue Williams in Griffintown. Kennedy was found sleeping off a hangover in the next room, and Michael Flanagan was also found on the premises. While Flanagan was cleared of all charges, Kennedy was found guilty and sentenced to hang until death on December 5, 1879. Meanwhile Gallagher's body was examined after two days and then thrown into a communal grave at Notre Dame des Neiges cemetery. Kennedy's sentence was eventually commuted to life in prison, but on December 5, the intended date of her execution, something strange happened to Flanagan. As he was working on the docks, he hit his head on the edge of the boat, fell into the water, and drowned. Was it Mary Gallagher's ghost finishing off her true killer? Today, nothing remains of the place where Gallagher was murdered except for the outline of the foundations in the asphalt of a parking lot. But as the story goes, Gallagher's ghost rises, and roams the city looking for its head every seven years. Want to know more? Visit the Fantômes Montréal website to find out about ghost tours of the city. Make sure to book early or other thrill seekers like you will take all the spots! If you would rather read old ghost stories like this one on your own at home, you need the decor and the snacks to go with it! 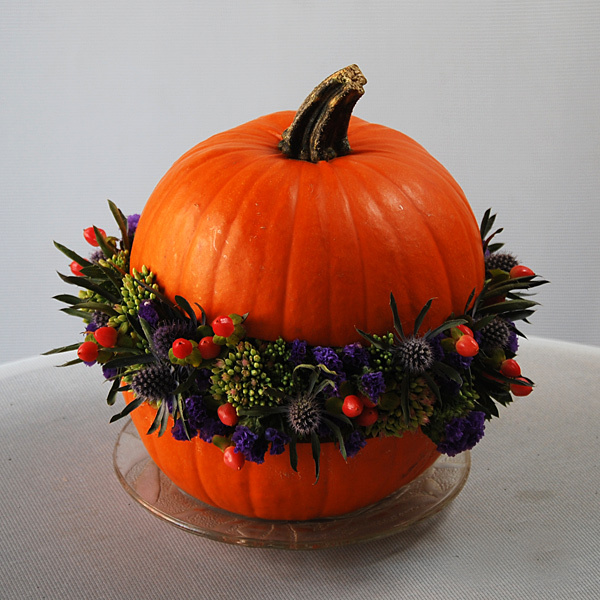 The Flower Pot's Halloween special, pictured here, is a pumpkin stuffed with flowers. Our Bookworm's Delight will complement your reading perfectly! Check out our other fall arrangements to get all the pieces you need, and don't hesitate to come by our store or call us at 514-938-1234 for more spooky decoration ideas!